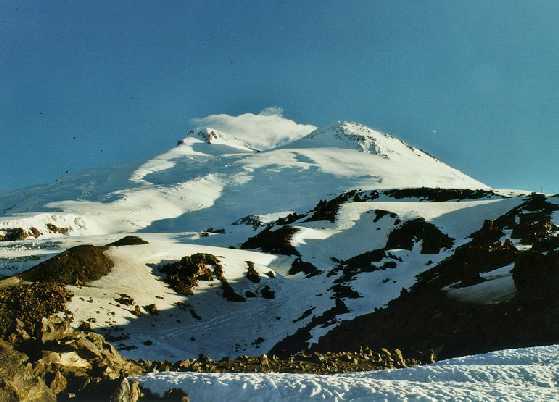 Elbrus, the summit of Europe. The seven summits, the highest peaks of the 7 continents! Trips, Statistics & information! No, the Mont Blanc is not the highest mountain in Europe! In fact it is not even in the top5 as there are many higher mountains in the beautiful but war-torn Caucasus. Enjoy the enormous snow slopes and celebrate with cheap Vodka! Infrastructure There is a cable car running: it starts at 2200m in Azau, the first stop is Stary Krugozor, 2900m; the second stop is Mir station, 3500m. From Mir a chairlift can take you to 3750m. At the end of this chairlift are 'the Barrels' and that's just what they are: old huge barrels, in each of which 4 people can sleep.